Set before the events of the previous films. As group of strangers awaken with no memory to find they have been involuntarily placed in a maze containing deadly traps, a young man whose job is to watch over the Cube endeavors to rescue a woman trapped within. Ryjkin: I hate this place. Q: What is the Cube? Q: What is 'Cube Zero' about? Q: Why do the cubes in this movie look different from the ones in "Cube"? Interesting Analogy On Political Ideologies? The CUBE series is intriguing from the standpoint that while very similar thematically, the underlying reason for its existence is mostly elusive. 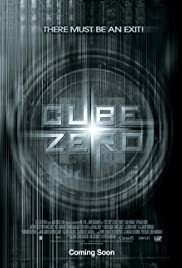 'Cube Zero' is supposed to take place before the original movie and does try to hint at its purpose. This movie was neither good or bad but it is worth a viewing or two. Every time I watch it the same thought crosses my mind - this movie is more of a play on the political ideologies of our day. One side represents the 'don't ask questions and stay focused' side while the other begins to question things when they become out of focus. You can see this very same phenomenon in action when you visit today's political chat sites. Both ideologies can validate their positions and each is only right or wrong depending on which side the viewer's personal convictions lie. This summation may be giving more credence to this movie than it deserves. Yet there is something a bit more than disturbing when the use of belief in God is used to buttress the justification for the existence of the regime. It echoes as disingenuous here as it does when used by some of our leaders today - no names, but you know who I'm talking about.